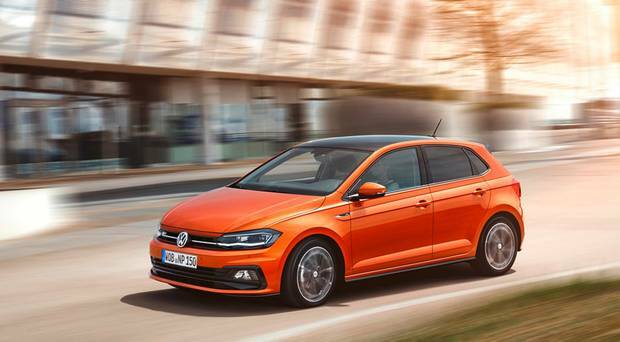 THEY are calling Volkswagen’s sixth generation Polo a ‘baby Golf’ with some justification. This is a big step forward for a car we can no longer call ‘small’. Yes it remains in the burgeoning supermini ranks, but it’s now as big inside as the old Mark III Golf. It also looks a good deal better than the old Polo. And along with being bigger and roomier, it has gone to a different level when it comes to the overall drive. Mind you, it would want to: there seems to be a fair bit of price rise involved. The new model gets here in November and prices will start around the €16,700 mark, I understand. There will be 1-litre 65bhp and 95bhp petrols initially. Later will come a 75bhp 1-litre petrol and a 1.6-litre 80bhp diesel. And there will be a 200bhp GTi in March. Engines above 90PS can have a dual clutch gearbox (DSG) as well as manual. Trim levels are Trendline and Comfortline; no Highline fripperies for this supermini, thankfully. Volkswagen recognise people want reasonable not esoteric spec on cars of this ilk. But you can add R-Line spec to Comfortline if you feel like it. Its big rival, the new Ford Fiesta, has only recently gone on sale here. It starts from €17,150 for the equivalent 5dr (no 3dr Polos) though Ford would argue it has more standard spec. The current Polo 5dr costs from €15,370. Volkswagen will also say its price increase is far outweighed by new technology, a roomier, bigger car and driver assistance systems. It’s still a fair old hike but with standard spec including Front Assist monitor with City Emergency Braking and Pedestrian Monitoring, the stuff is in it, I guess. Adaptive cruise control (ACC) and semi-auto Park Assist are options. In a way the interior reflects the biggest improvement (and reason for price?). It’s not a radical re-draw but especially notable were the levels, quality and texture of materials – such as soft-to-touch plastic dash-top in the 75bhp 1-litre Comfortline version we drove. Layout and instrumentation were, thankfully, clear and simple. This is the first Volkswagen Group car with the new-gen Active Info Display (the latest infotainment system has 6.5ins to 8ins displays). I quickly got to an excellent driving position and the big, tall man behind me had loads of knee room. He’s 6ft 2ins and I’m not far off that either so here was a practical demonstration of just how highly it scores in that department. I also got good adjustment on the seats and I paid special attention to the cushioning and excellent side supports on the front two. On top of that, boot space has gone from 280litres to 351 litres. It took our carry-on cases and other small bags. All of that space is explained by the following: The car is now 4,053mm long (+81mm), 1,751mm wide (63+) and 1,446mm high (7mm lower). The 2,564mm wheelbase is 92mm longer while track widths are up 62mm at the front (to 1,525mm) and 49mm at the rear (to 1,505mm). My drives were over mostly decent roads but where we encountered dips, divots and roughness the new suspension set-up and 17ins wheels/tyres were proficiently absorbent; way better than the old one. Noise suppression generally was muted from wind, engine (except when we floored it on the autobahn) and the wheels. The 5spd manual gearbox shift was ok, no more, but the electric power steering was well weighted and maintained decent feel. It’s what I’d call a precise, crisper drive now. But I keep coming back to the cabin where the excellent head room created a sense of much more space – out front and, as I’ve mentioned, at the back. And you sure get a choice about how the car looks with 14 exterior colours, 12 wheel sizes/styles, several ‘dashpad’ décors and 11 different seat covers. The Polo has been a starter car for so many young people but it’s also a big favourite with downsizing mature owners and as a second family car. A bit of an all-rounder. It certainly is, considering more than 14 million young, old and middle-aged drivers worldwide have bought one from new over the previous five generations. I’ve a feeling there will be a few million more paying their money to own this sixth generation. Somehow, I don’t think price rises will deter too many from a car that feels so much like a smaller Golf.